I’m doing my best these days to go out and network as much as possible. It never ceases to amaze me the people I meet here in San Francisco and everywhere else I travel. One day I might meet the guy who created some iPhone app I cannot live without, the next day it’s the owner of French champagne house or while I’m eating dinner at Ristorante Ideale with my parents and I meet an awesome couple visiting from Toronto. In all of these situations I am left wanting to connect with these interesting and sometimes inspiring people. Problem is, I always realize I want a card to hand them when it’s too late. This is where a business card comes in handy. But instead of handing out your business card why not hand out a social card? That’s what I decided to make today. This simple card gets across what I feel are the most important take-aways. First of all my name is big and bold on the front of the card. I don’t list my profession or position but I do list the three things people pay me to do, photography, marketing and public relations. That’s really all anyone needs to know about what I do. Remember this is a social card, not a business card. On the back I give a few more specific details like my email, phone number, Twitter handle and of course, this website’s address. I could have linked Facebook, LinkedIn, Google+, YouTube and probably a dozen other sites but for me, these are what were important. It’s simple, clean, easy to read and effective. 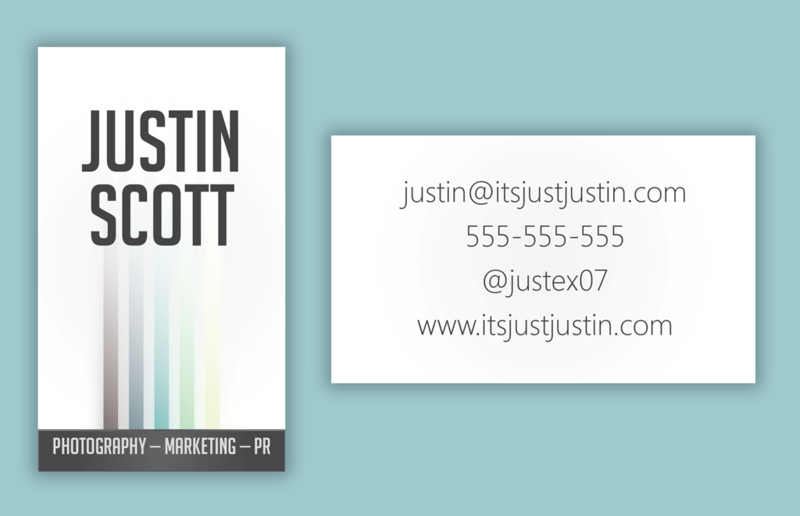 Business cards, or in this case, social cards, are cheap too. I ordered 250 of these cards on heavy stock paper for $39 and they should be ready for me tomorrow. If I printed them online it would have been half the price or less! So make yourself a social card, even if you already have a business card. It’s a solid way to make networking outside of work that much more effective. Plus if you are in-between jobs, planning on switching jobs or don’t want people to know where you work, this card fills the business card void. Here are a few tutorials on how to make a business card without the expensive designer, as long as you have the expensive software. I can’t find the tutorial I used to design my card but the ones above are pretty solid.